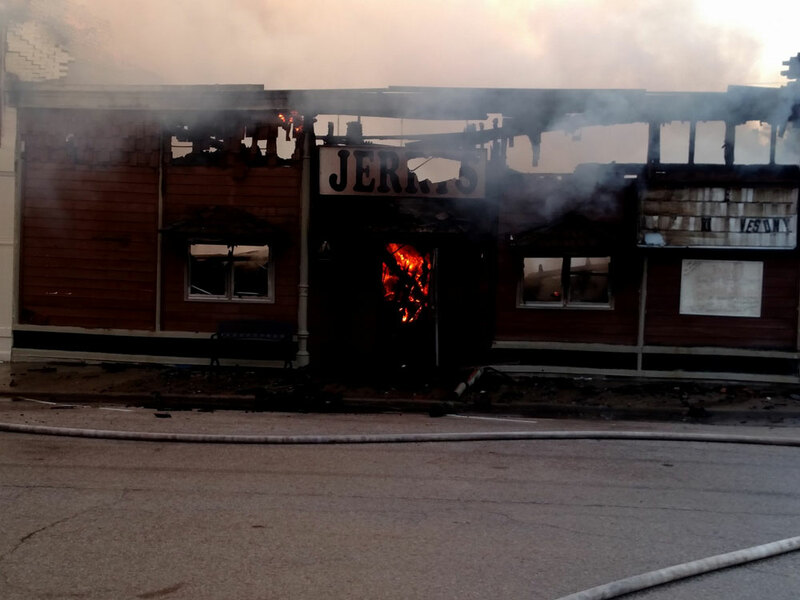 A fire at this bar, Jerry’s Joint in Exira, spread to several other buildings. 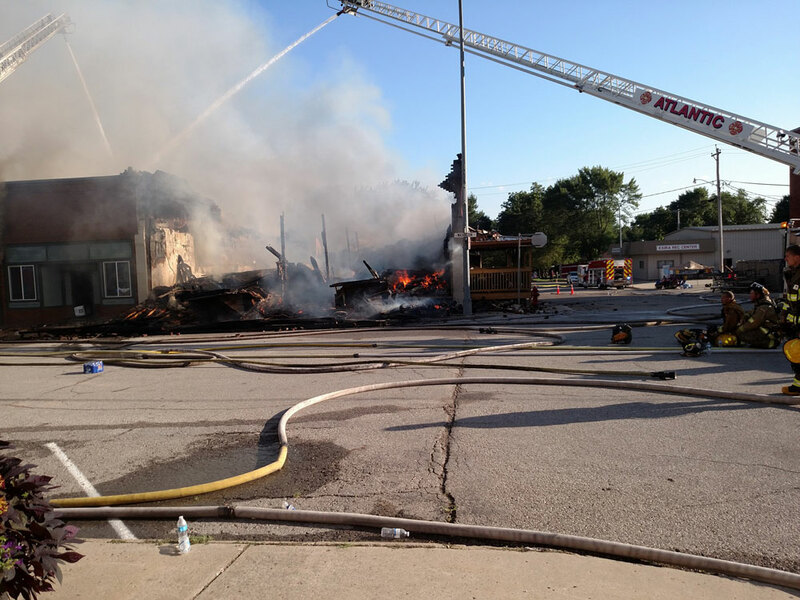 A major fire in the western Iowa community of Exira has destroyed a bar and nearby buildings in the block are flattened, too. The bar — called “Jerry’s Joint” — had been renovated not long ago and it’s been leveled. 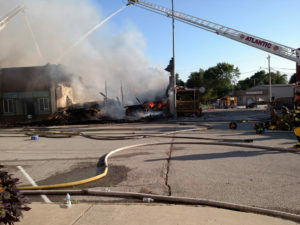 Three adjacent structures have been gutted. Fighting the fire has been complicated by a lack of water. “We summmoned several fire departments from around here because they said they had heavy smoke coming from the building,” Exira Fire Chief Mike Binter said. “We had 26-plus departments here, hauling and shuttling water, plus one private outfit. Ladder trucks with high pressure hoses and snorkels were on hand from Atlantic and Harlan. Pumper trucks from 20 other cities helped fight the blaze, too. Water was trucked in from Audubon and an abandoned gravel pit nearby. 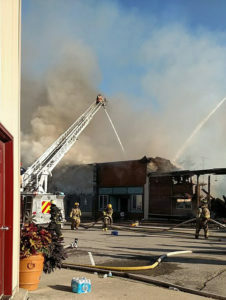 It’s unclear how many gallons of water have been used, but Exira’s fire chief said the ladder trucks fighting the fire from above use between 1200 and 1500 gallons a minute. Fire fighters loaded water onto their rigs from several huge, rubber “bladders” set up on the street. Aerial trucks dump water on the fire. The fire was reported shortly before 3 a.m. The owner of the bar has told reporters he was asleep in his home in a nearby building when someone called to say the bar was on fire. The bar did not offer food, other than pizza baked in a pizza machine, and the machine was not used last night according to the owner, who worked the bar last night. 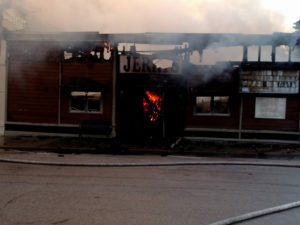 Several buildings in Exira were damaged after a fire started in a bar. There have been no injuries reported. Firefighters did retreat when it became clear the building in which the bar was located was going to collapse. Later, as windows on a building two doors down from the bar started to rattle, crews backed off again to avoid the shattering glass. The windows blew out because of the fire’s intensity. Residents of the area have been providing food and beverages to the fire crews.